Sony releases Music Unlimited on Android Marketplace | What Hi-Fi? Sony has officially launched the Music Unlimited subscription streaming service on the Android Marketplace. It brings the 10-million-strong catalogue of tracks to compatible Android devices including Sony's own Tablet S, which we'll be reviewing in our December issue, out November 16th. 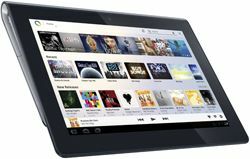 The Tablet S ships with direct links to Music Unlimited and Video Unlimited, plus the PlayStation Store – and Sony Tablet users who sign-up for the service for the first time can get a 180-day trial of the basic service. Otherwise a basic subscription to Music Unlimited is £3.99/month, while a premium subscription is £9.99/month. The Music Unlimited service, previously known as Qrioicity, can be found on the Android Marketplace, plus on smartphones, Sony internet TVs, Blu-ray players, the PS3 and other internet-enabled Sony devices.